Distracted driving is automatically associated with texting-and-driving – and rightly so – but distraction can be anything that takes your eyes off the road, hands off the wheel or mind off the complex task of driving. It’s incredibly risky behavior, as our Fort Myers car accident lawyers know, placing not only the driver in danger, but also passengers and everyone else who shares the road. 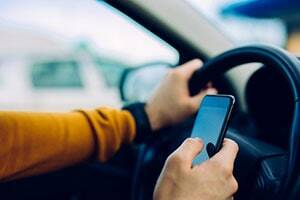 It has become widespread (more than three-quarters of Americans have smartphones, including 92 percent of 18-to-29-year-olds – one of the most at-risk driving cohorts, according to the Pew Research Center). The National Highway Traffic Safety Administration (NHTSA) estimates nearly 3,500 people die annually in distracted driving accidents. When distracted driving causes a crash, The Garvin Law Firm’s auto accident attorneys in Fort Myers can help you fight for compensation. It’s important to hire the best injury attorney you can find because distracted driving is not as easily proven as, say, drunk driving. Unless the offending motorist has admitted to it, establishing driver distraction often requires extensive investigation. It’s not always necessary to prove driver distraction to win your case, but it can help bolster the assertion that defendant driver was not using a reasonable degree of care – an essential element to proving negligence and recovering damages. Our dedicated injury lawyers can formulate an optimal legal strategy to maximize your chances of success in a securing a favorable settlement or verdict. In Florida, as in many other states, drivers have a legal duty to use reasonable care anytime they are engaged in something that might foreseeably cause harm. We know driving a vehicle certainly has the potential for harm, given that an average of 370,000 crashes happen in this state each year, according to the Florida Department of Highway Safety and Motor Vehicles. It’s been well-established that this duty of care includes the responsibility to obey traffic laws, adjust speed according to road conditions and be sober. Keeping your pets and children safely secured so they aren’t moving around inside the vehicle, possibly capitalizing your attention. Not eating or drinking in the car. Avoiding putting your makeup on while simultaneously operating the car. Keeping conversation with others in the car (including children) to a minimum. Limiting your “daydreaming” so your mind stays on the task at hand. Avoid adjusting the radio, temperature, GPS or other internal controls while the car is moving. Keeping your cell phone out-of-reach while driving, so you aren’t tempted. Although any number of things have the potential to be a distraction, Florida’s distracted driving law focuses specifically on cell phone use, particularly targeting texting. F.S. 316.305, Florida’s Ban on Texting While Driving Law, specifically prohibits operating a motor vehicle while manually typing or entering multiple letters, numbers, symbols or other characters into a wireless communication device or while sending or reading data on such a device for purposes of nonvoice interpersonal communication. This can mean texting, but also e-mailing and instant messaging. This provision doesn’t apply to someone who is dialing a phone number, reporting an emergency or receiving messages relating to radio broadcasts, safety-related information (traffic and weather alerts) or navigation. It also doesn’t prohibit someone from merely talking on the phone, even though we know that is a major distraction for many drivers. Teens and younger drivers are at especially high risk, with the NHTSA reporting approximately 11 percent of those killed in crashes dying in one involving driver distraction. One of the primary complaints about Florida’s texting-and-driving law is that it designates texting-and-driving a secondary offense. That means unlike a primary offense, law enforcement cannot initiate a traffic stop based solely on this offense. It’s only if the officer has another reason for the stop (i.e., violation of a traffic law, a crash, etc.) that a ticket for texting can be issued. Even then, it’s a meager $30 fine for a first-time offender. Ongoing state legislative efforts could change this in the coming years. Our injury attorneys in Fort Myers are committed to helping victims of distracted drivers obtain just compensation for their injuries. Contact our Fort Myers attorneys at The Garvin Law Firm today at 239.277.0005 or online for a free case review.